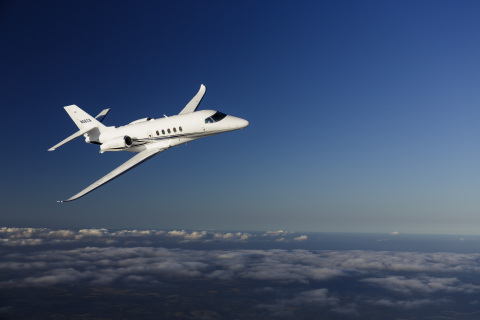 Cessna Aircraft Company, a subsidiary of Textron Aviation Inc., a Textron Inc. (NYSE:TXT) company, today announced that the Citation Latitude business jet has achieved type certification from the U.S. Federal Aviation Administration (FAA). Deliveries are scheduled to begin in the third quarter of this year. The new Citation Latitude represents the perfect balance of comfort and efficiency and is the first business jet to combine a roomy, flat floor, stand-up cabin, with a midsize price and best-in-class operating costs. FAA certification follows the aircraft’s first Atlantic crossing and European debut at the European Business Aviation Convention & Exhibition in May. Customer reception remains strong as the aircraft’s transcontinental and European performance capabilities were showcased during a month-long regional demonstration tour. The aircraft flew non-stop from St. John’s, Newfoundland to Valencia, Spain in just over 5 hours demonstrating notable fuel efficiency that would allow the aircraft to continue to several additional European destinations. The Citation Latitude will continue its global debut schedule throughout the remainder of the year. The Latitude is entering the market with enhanced performance specifications, including increased range of 2,850 nm at long-range cruise and 2,700 nm at high-speed cruise, as well as improved runway performance of 3,580 feet, all of which are reflected in final certification results. Among the first customers is NetJets, who has ordered up to 150 Citation Latitude business jets, with initial deliveries beginning in 2016. Assembly of the Citation Latitude features a variety of technological advancements including the use of new automated robotics, monolithic machined structures and ergonomically friendly tooling stations, resulting in greater precision throughout the build process. Through these advancements, customers benefit from the highest quality, increased maintenance intervals and reduced aircraft down times. This, combined with the Latitude’s increased performance, results in up to 20 percent lower operating costs than competing aircraft. The flight test program for the Latitude began with its first flight in February 2014 and grew to include four test articles that flew 690 flights and amassed 1,697 flight hours. The accelerated test program validated the maturity of the Garmin G5000 avionics system and features such as the new auto-throttle, which reduces pilot workload in critical phases of flight for enhanced safety. The Citation Latitude features a larger fuselage accommodating up to nine passengers. Designers created the most open, spacious, bright and refined cabin environment in the midsize category with a flat cabin floor and 6 feet (1.83 meters) of cabin height. Innovation abounds with unique features designed throughout the aircraft such as the electronically-operated cabin door ushering passengers into the widest fuselage of any Citation. Cessna’s ClairityTM cabin-technology system provides connectivity and entertainment to each passenger through their personal electronic devices. Improving cabin comfort for passengers and crew alike, the Latitude features a new cabin cooling system and a new pressurization system, which provides a 5,950-foot cabin altitude at the aircraft’s maximum operating altitude of 45,000 feet (13,716 meters). Today’s news reflects the company’s focus on continued investment in general aviation’s most extensive product lineup. Five new Citation aircraft have been certified during the past 18 months including the Citation M2, Citation CJ3+, Citation Sovereign+, Citation X+ and now the midsized Citation Latitude. The company’s super midsized Citation Longitude is expected to be certified in 2017. Web page: Find Citation Latitude information on our website. Certain statements in this press release are forward-looking statements which may project revenues or describe strategies, goals, outlook or other non-historical matters; these statements speak only as of the date on which they are made, and we undertake no obligation to update or revise any forward-looking statements. These statements are subject to known and unknown risks, uncertainties, and other factors that may cause our actual results to differ materially from those expressed or implied by such forward-looking statements, including, but not limited to, changes in aircraft delivery schedules or cancellations or deferrals of orders; the efficacy of research and development investments to develop new products or unanticipated expenses in connection with the launching of significant new products or programs; the timing of our new product launches or certifications of our new aircraft products; our ability to keep pace with our competitors in the introduction of new products and upgrades with features and technologies desired by our customers; changes in government regulations or policies on the export and import of our products; volatility in the global economy or changes in worldwide political conditions that adversely impact demand for our products; performance issues with key suppliers or subcontractors; and continued demand softness or volatility in the markets in which we do business.